Manning Drive is an important commuter and goods movement corridor for the northeast area of the City providing the connection to Fort Saskatchewan, Gibbons and Alberta Industrial Heartland. Manning Drive (Highway 15) is part of the Regional Highway System under Provincial jurisdiction. This area of the City will be experiencing tremendous growth over the next few years, including the neighbourhoods of Horse Hill and the Edmonton Energy and Technology Park (EETP). This future growth will necessitate ultimate upgrades to the Manning Drive corridor to achieve a fully free-flow corridor with accesses provided through interchanges at Meridian Street (1 Street) and at Highway 28A in the long term. A flyover will also be constructed at the current intersection location of 18 Street and Manning Drive (Highway 15) in the long term, once alternate access to the area is established. The City of Edmonton is currently undertaking a safety and operational review of the intersections of Manning Drive (Highway 15) at 18 Street NW and at Highway 28A (17 Street NE). The purpose of this study is to identify and confirm traffic safety issues to determine interim measures that will improve road safety and operations over the next several years, until the ultimate interchanges are constructed. Following several citizen and landowner concerns raised at previous public meetings , the City of Edmonton has initiated the review of these intersections from a safety perspective to address existing issues. Poor pavement condition, roadway geometry and lane markings. Public and Stakeholder input will also help guide the decision making process once appropriate countermeasures are recommended from the technical safety review. Funding for implementation of intersection improvements has not been approved at this time. When funding is approved or available for these improvements, further planning and design will be needed prior to implementation. 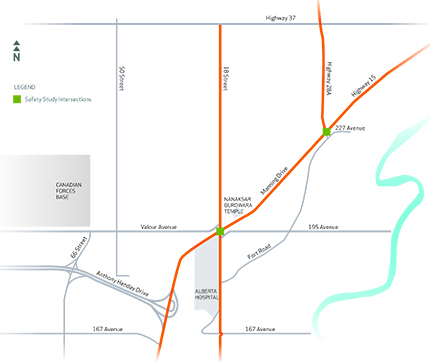 The City of Edmonton is seeking input on roadway operation and safety concerns from users of this section of Manning Drive (Highway 15). Input will be received in a number of ways including an Information Session and an online survey, details to follow. This operational and safety review was scheduled to be complete by November 2015. The recommendations from this review will help to improve the safety of intersections and accommodate growth in the area in the short term. The recommendations will also be presented to Alberta Transportation for discussion, as Manning Drive is within the Province of Alberta Highway Network. There is currently no funding allocated to this project therefore there is no timeline for construction. On Wednesday, October 14, City representatives gave detailed information regarding the Manning Drive Safety Review. Below are the links to the presentation materials as well as any information that was distributed and displayed.